For accommodation in Brisbane, experience the luxury of boutique accommodation in an elegantly restored Queenslander, a house built in the 1800s by a family whose name is synonymous with Brisbane’s colonial past. 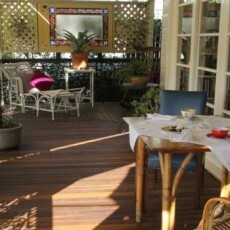 Enjoy the experience of alfresco dining at local restaurants and cafes. Walk to Suncorp Stadium or stroll down Park Road to the Brisbane River and its pedestrian and bike paths. Buses, trains and taxis are minutes away. Brisbane’s sunny days and balmy, sub-tropical weather ensure that our guests enjoy the Queensland experience of relaxing on a shady verandah any time of the year. We were featured on on The Great South East in April last year? You will be able to see details at the The Great South East.